Dutcher (2004) says "English is the national (official) language. Tigrigna and Arabic are used in many official situations and documents. Tigrinya is spoken by a little over half of the population. Tigre? and other languages by the rest. 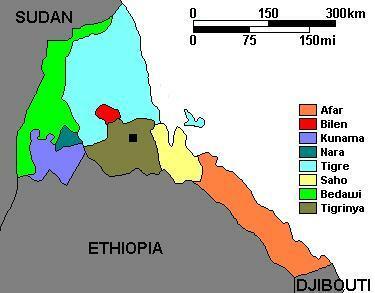 At right is a map showing approximate areas where Eritrean languages are spoken (source: Homepage of Mebrat Tzehaie, accessed 2007, now offline). According to Dutcher (2004) communities choose language of primary schooling and prefer Tigrinya, Arabic or the local language. English is the medium of instruction from grade 6 on. Ge'ez (guèze in French) is sometimes also called Ethiopic in Ethiopia. Efforts to promote use of Unicode fonts began around 2000.